The alarms sounded in the early morning sun, early enough for the outside air to chill the bones. After our standard yogurt and cereal breakfast, we piled into the van and made our way to the Ice Springs volcanic field, the site of our field work for Independent Study. By chance, we met the manager of the quarry along the narrow road in a near head on collision before making our way up the winding road of the cinder cone with the manager’s warnings of careless truck drivers at the forefront of our minds. 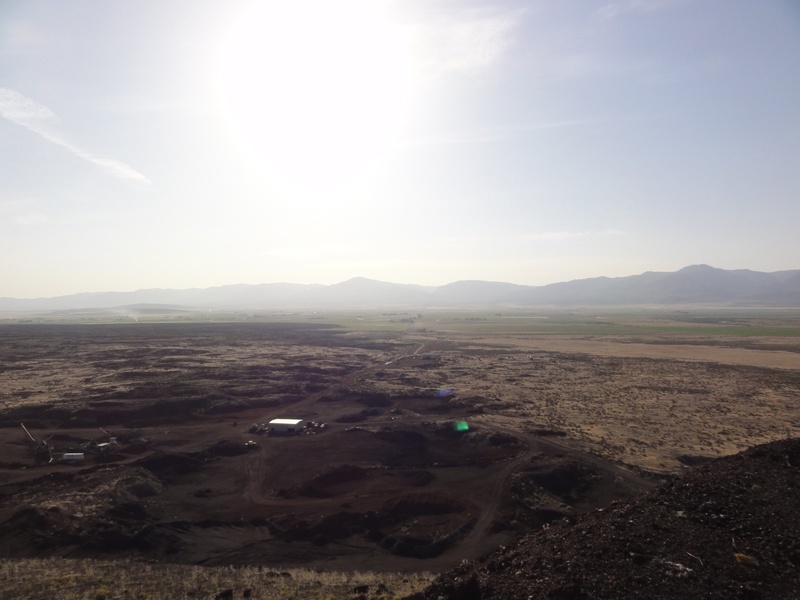 Once we arrived at the top of the cinder cone, we were able to enjoy the incredible views of the surrounding valley. The first feature we came to was the Crescent crater. As we viewed the expanse of the lava flow below us, it became quite clear at this point that trying to map the entire field would take much longer than the two short weeks that we have to work in Ice Springs. Looking northeast from the summit of Crescent Crater. After becoming oriented with the area, we made our way to Miter crater and came across extensive exposures of xenoliths. We paused for a snack and to reapply sunscreen before heading out onto the lava flows, and it was here we realized a harsh reality. The lava flows are very complex, but luckily provided better footing than the cinder of the crater slopes. Assessing the lava flows led us to the flows breaching Miter crater. The ascent back up Miter crater proved to be more challenging than expected, but we were truly independent minds working together to find flat ground. Once everybody caught their breath, we wandered back toward the van to make our way back down the cinder cone. We then made an attempt at circumnavigating the volcanic field using the rather primitive roads that were more attuned to cattle herds than cars. This feat proved to be futile as nothing less than an ATV could navigate the rough terrain we encountered. Upon our misfortune, and the near loss of our bumper, we decided to head back to camp. Along the way, we all took a nap, leaving poor Dr. Judge and Dr. Pollock to navigate our group safely back to the camp site in silence. 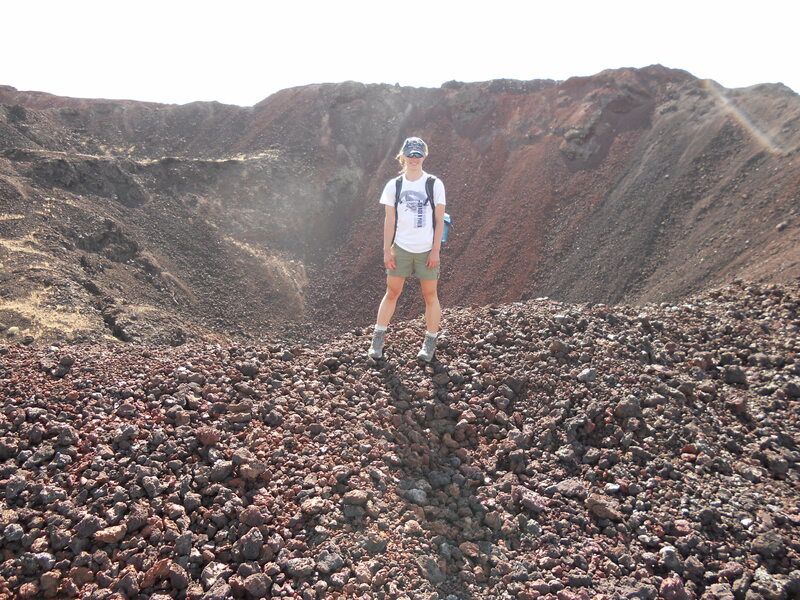 Tricia Hall standing in front of Miter Crater. Once back in our accommodations, the kozy kabins, we all went our separate ways for some R&R. We each met individually with the professors to discuss our project ideas once again following our initial introduction to our field site. Around 5:30 pm, we all piled into the van once more to scavenge for nutrients at the quality establishment known as 5 Buck Pizza. We had 4 of them. They were good. Will and Matt guzzled 8 pieces of pizza each, leaving the rest of us starving.